A planet with an Earth-like temperate climate was recorded in a first-ever photo of its type orbiting its host star. 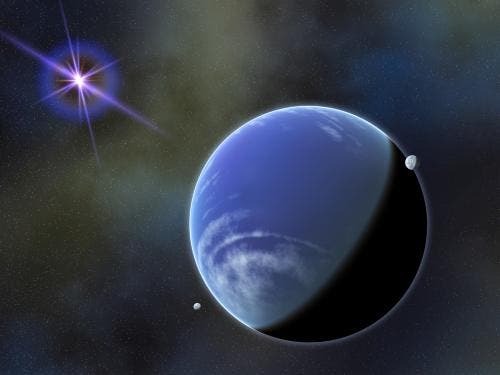 "This planet-like companion is the coldest object ever directly photographed outside our solar system," said Kevin Luhman, Penn State Associate Professor of Astronomy and Astrophysics , who led the discovery team. "Its mass is about the same as many of the known extra-solar planets — about six to nine times the mass of Jupiter — but in other ways it is more like a star. Essentially, what we have found is a very small star with an atmospheric temperature about cool as the Earth's." Luhman classifies this object as a "brown dwarf," an object that formed just like a star out of a massive cloud of dust and gas. But the mass that a brown dwarf accumulates is not enough to ignite thermonuclear reactions in its core, resulting in a failed star that is very cool. In the case of the new brown dwarf, the scientists have gauged the temperature of its surface to be between 80 and 160 degrees Fahrenheit — possibly as cool as a human. Astronomers have named the brown dwarf "WD 0806-661 B" because it is the orbiting companion of an object named "WD 0806-661" — the "white dwarf" core of a star that was like the Sun until its outer layers were expelled into space during the final phase of its evolution. "The distance of this white dwarf from the Sun is 63 light years, which is very near our solar system compared with most stars in our galaxy," Luhman said. "The distance of this white dwarf from its brown-dwarf companion is 2500 astronomical units (AU) — about 2500 times the distance between the Earth and the Sun, so its orbit is very large as compared with the orbits of planets, which form within a disk of dust swirling close around a newborn star," said Adam Burgasser at the University of California, San Diego, a member of the discovery team. Because it has such a large orbit, the astronomers say this companion most probably was born in the same manner as binary stars, which are known to be separated as far apart as this pair, while remaining gravitationally bound to each other. In a related new discovery involving a different cool brown dwarf, Penn State Postdoctoral Scholar John Bochanski and his colleagues have made the most detailed measurement yet of ammonia in the atmosphere of an object outside our solar system. "These new data are much higher quality that previously achieved, making it possible to study, in much more detail than ever before, the atmospheres of the coldest brown dwarfs, which most closely resemble the atmospheres that are possible around planets," Bochanski said.